All the children are well. Not just some, but all. If you’ve studied linguistics, you know that words reflect culture and shape the way we think. The Masai people’s key introduction and conversation premise is about the well-being of children. Their entire way of life focuses on the well-being of young people. What would it look like if the U.S did that? What would our schools look like? Homes? Jobs? Communities? Young people need to be front and center in every situation. Not in detention centers. Not suspended and sent home. They need to be listened to. Believed. Championed. How do we shift the paradigm to our culture to reflect these values? Hearing, uplifting, and making room for and with young people is a way to start. Check out the opportunity coming up in September for young people to fully take the mic. The Minnesota Youth Council is working to create an event to build power, network with others, and provide opportunities to learn from youth all around the state. 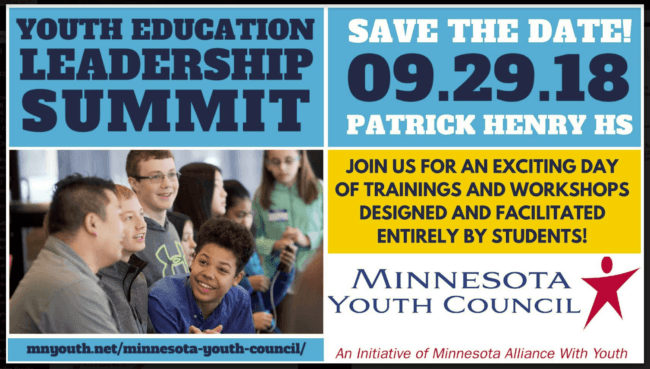 The Youth Education Leadership Summit will take place on Saturday, September 29th at Minneapolis Patrick Henry High School. Join us for an exciting day of trainings and workshops designed and facilitated entirely by students. The day will be capped with a Governor’s Forum moderated by young people, and will be open to the public.